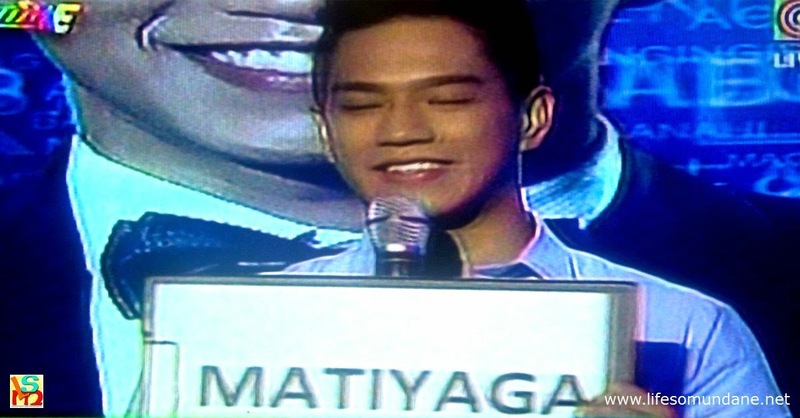 Whereas Ajay Cabrera, the other contest from Lipa who made it to the semi-finals of the Gandang Lalake segment of ‘It’s Showtime,’ lost control of his emotions during the Q&A, there were no such problems for DLSL alumnus Ross Dimaculangan today. Ross is older than Ajay, of course; but I think the difference between the ways the two young gentlemen handled the pressure of the semis had less to do with age and was more a matter of personality and disposition. Even in the eliminations, Ross won the nod of the judges I believe less because of good looks – although he has plenty – and more because of his apparent intellect and a naturally calm demeanour. There are many better looking than Ross among the semi-finalists; but few come close in terms of self-assuredness. It cannot be easy being surrounded by all those celebrity hosts knowing that one is on national television; but you will never guess it watching Ross, whose projects a rare confidence and serenity whilst onstage. Not that Ross even has to win this silly pageant because he has a career in the banking industry. If he treats his work with the same assuredness with which he has taken the Showtime stage, then success shall come as a matter of course. I would like to think that we at DLSL, from where Ross obtained his Marketing Management degree, had something to do with this attitude – the confidence and belief with which to face a stressful situation. Albeit, Ross himself would have earned both on his own, having sent himself through school by being a working student. At DLSL, we were well aware that our working students rather tended to do well in their respective careers after their graduation from college. It was down not just to the correct work attitudes that they developed early; but juggling work and studies at a young age gave them a better understanding of what life would expect of them later in their lives. One will appreciate Ross’ determination to make something of himself more when one understands the type of working student that he was. At DLSL, we had the clerical assistants who could be insulated inside airconditioned rooms and who could use the time during light working days to review their lessons or do their homework. Ross was not one of those. Instead, he was among the school’s maintenance assistants, who helped the engineering department with maintenance and janitorial work. These working students often had to stay on campus to do clean-up work long after regular students had retired to the comforts of their homes. Where others would be embarrassed by having to do maintenance work, Ross was proud that he was sending himself through school and not being choosy about tasks he was asked to do. After eight years of doing so, therefore, how terrifying could the Showtime stage be for somebody who had learned at an early age that anything in life could be overcome with the right attitude? Fittingly, the topic that Ross was assigned to expound on today was ‘matiyagâ,’ a characteristic that he needed to develop early as a working student. In the 30 seconds that Ross was allowed to speak on the subject, he was able to portray his determination to succeed in life while being a working student and was also able to acknowledge the support he received from members of his family. God knows one cannot really say an awful lot in 30 seconds; but by just being on that stage looking totally at ease and unfazed by the occasion ought to be a source of inspiration to many young people who are sending themselves through school the way Ross once did. Whereas other semi-finalists began to stutter and lost their composure at the sound of the 10-second timer, Ross just matter-of-factly went on to finish what he had to say. In fact, of the semi-finalists that I had seen, Ross has got to be among the most composed if not the most composed during the Q&A. If this male pageant is to be judged on responses alone, Ross will win this by a mile. It did help that he was graceful during the segment’s opening dance, something that Karylle, speaking as judge, was quick to acknowledge. I wrote previously that Ross was a great advertisement for DLSL, the school from where he graduated. Today he was still that but more. He was also a great advertisement for students around the country who have to work for their education; and an inspiration to those still in school hoping one day to start building their careers.